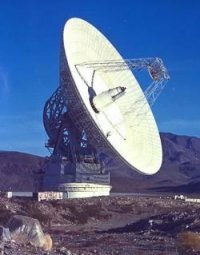 The Deep Space Network (DSN) is NASA's international network of antennas that supports interplanetary missions, some selected Earth-orbiting missions, and radio astronomy. Its three Deep Space Communications Complexes combine to make the largest and most sensitive telecommunications system in the world. To give some idea of DSN's sensitivity, the antennas are still able to capture science information from the Voyager probes even though the downlink signal reaching a DSN antenna is more than 20 billion times weaker than the power level at which a digital watch functions. The DSN is a NASA facility managed and operated by JPL (Jet Propulsion Laboratory). 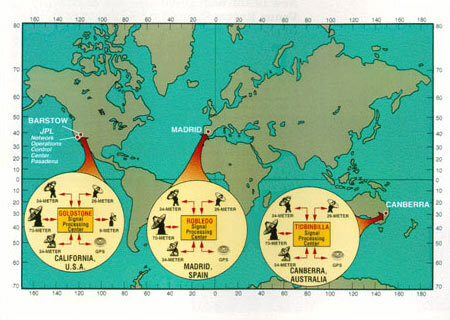 Established in 1959, the Deep Space Network is comprised of 16 primary antennas at three sites around the world – Goldstone, California, USA; Canberra, Australia; and Madrid, Spain. Although it is currently able to keep up with most of its workload, a report by the US Government Accountability Office (GAO), released in May 2006, concluded that the network may have trouble in meeting demand over the coming years. Ageing of the Deep Space Network has already had an impact on some routine operations. Corrosion on a sub-reflector of the 70-meter dish in Madrid led to a communications outage during a key phase of the Deep Impact mission in July 2005. Program managers shifted to back-up ground stations, but that resulted in other missions being sidelined at that time. Then in October 2005, corrosion to a power line led to a major power disruption, causing several Goldstone antennas to stop working for several hours, losing an unknown amount of science data. Goldstone, which has some of the oldest equipment in the network, is not operational for an average of 16 hours per week due to age-related maintenance and repairs. The 2006 GAO report noted that since 2002 NASA had deferred spending about $30 million annually for maintenance work on the DSN. This was mostly earmarked for secondary infrastructure, such as roads at the facilities rather than the antennas themselves. The report recommended that NASA conduct long-term planning to address gaps in the network's current capabilities and mission requirements.